VietNamNet Bridge – HCM City will focus on reducing pollution in rural districts and communes, local authorities said at a conference held in the city on Thursday to review the National Target Programme for New Rural Areas 2016. 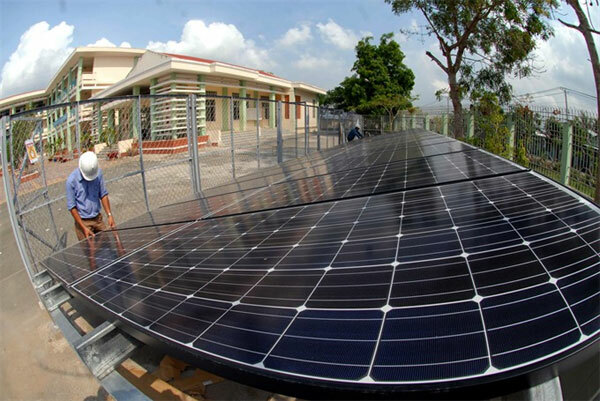 Solar energy panels installation at the secondary high school of Tan Nhut Commune outside HCM City. The commune has all criteria for new-style rural communes. The rural area programme and action plan for this year was organised by HCM City’s Party Committee. “From 2010 to 2015, all 56 communes of the city reached environmental standards but under the standards of new rural areas, only 24 of the total 56 communes reached safety level for environment and food hygiene,” said Nguyen Phuoc Trung, director of the city’s Agriculture and Rural Development Department. According to rural district authorities, rubbish collection has been a great challenge, with most of it done by individuals. In some places, rubbish is collected every three days, while in others, rubbish collectors ask for fees beyond the regulated price. Most scrap collection centres have worked without permission and caused pollution, and many canals in rural districts are seriously polluted and need immediate upgrading. To cope with problems related to environmental protection, the city’s Natural Resources and Environment Department has finished its plan to upgrade environment standards in rural areas from 2016 to 2020. The plan will focus on solutions to pollution, which has badly affected local residents, especially in places affected by climate change. The plan will also build a new model for new rural areas based on urban civility. “Building a new rural area needs active contributions from organisations and ideas from local residents,” said Tat Thanh Cang, deputy secretary of the Party Committee, and head of the Party Committee’s Steering Committee for New Rural Construction Programme. “Leaders of the party hierarchy and authorities must take a leading position to find proper way in implementing the programme,” he added. Cang also said the environmental sector should work closely with local authorities in dealing with rubbish collection and environmental protection. “Related authorities and local government should encourage residents to plant more trees,” he said.